Atelier Charlotte Auzou: Charlotte creates customisable and made to measure dessses for every occasion. Coralie Bijasson: Coralie runs the sewing pattern brand “C’est moi le patron!”, and her designs are beautifully timeless. Pauline Alice: settled in Spain, Pauline is inspired by retro and very feminine shapes. The book is published by Mango éditions, a publishing house part of the Fleurus group and speialized in craft hobbies. All the fabrics we used come from the French designer Atelier Brunette and the Belgian shop Stragier. The book is released on May, 18th. The beautiful pictures have been shot by Claire Payen. A massive thank you to all the team for such a great result! 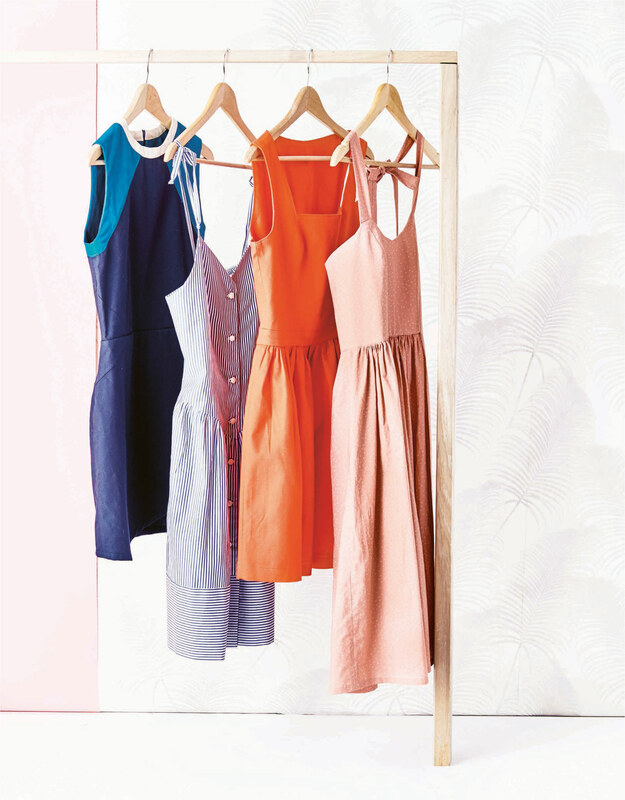 Simple and summer-like, this dress is a mix between stylish details and very clear lines, inspired by aprons. Its length goes just under the knee, the skirt is straight with slits on the sides and a wide double-pocket on the front. The thin straps are tied at the back (you can cross them or leave them straight) under hidden loops. The dress is closed by a concealed zipper at the side. Quick and very easy to make, this sewing pattern is perfect if you want to sew one of your first homemade dresses! Writing for a book is different from creating a pdf file where the number of pages is unlimited! We were not able to insert all the information that we usually give in our patterns, so here are a few things that should help you to imagine what our dresses are like. 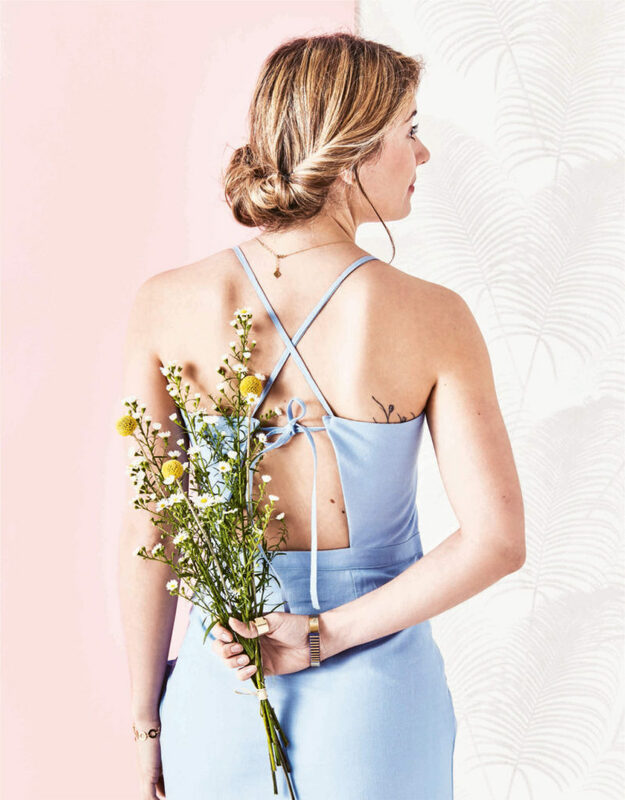 In the pictures, the dress is made with an azure linen percale (222g/m2) that you can find at Stragier, a white 73g/m² fusible interfacing (Stragier too) and Gütermann light blue cotton thread (shade 5826). To design Myrte, we gave a new twist to sport garments universe. 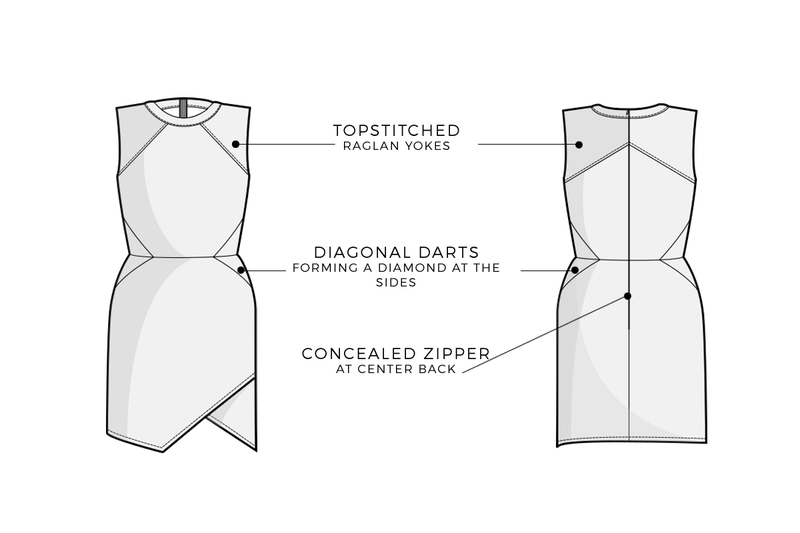 Fitted and sleeveless, Myrte is a short dress (mid-thigh) with geometric cuts (raglan cuts, diagonal darts, asymetrical hem line…) that are very distinctive. The contrasting neckband is inspired by sweatshirts. 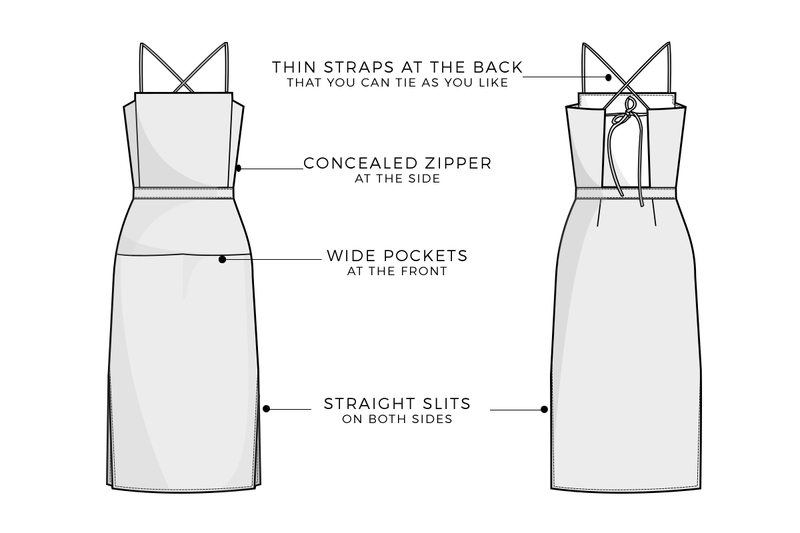 The dress is closed by a concealed zipper at the center back. We do not recommend this pattern for absolute beginners, you should have already sewn some garments before you start. 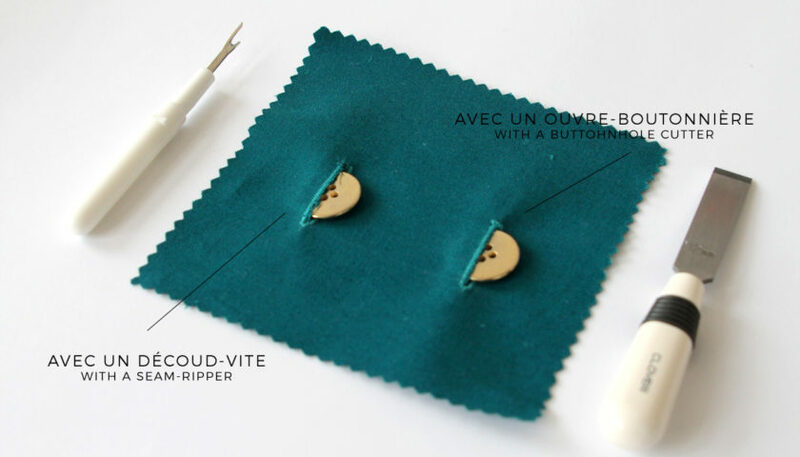 Sewing that dress is not particularly complicated, but a little accuracy is required to properly assemble the neckline and yokes, and to match the different pieces and seams properly. Opt for a medium weight supple woven fabric. Your fabric can be a bit stretchy if you wish. Avoid thin fabrics (batiste or crepe) and rather choose twill or plain weave fabric. If you are a beginner, we recommend you opt for a stable fabric (non slippery nor stretchy) to make it easier. In our pictures, the dress is made with 100% cotton twill (176g/m2): navy, peacock blue and ivory. Threads are 100% cotton Gütermann: navy (6210), green (7235) and ivory (802). The size chart is identical to ours, except for the overall height of the body, which is 165cm/64.9” instead of 168cm/66.1”. There is only 6 sizes (34 to 44) instead of 7 in our patterns. Sewing allowance is NOT included, you will have to add it before you cut your fabric. The required seam allowance is indicated in the book for each pattern piece. Where can I find the book and patterns? The book is available in book stores and some haberdasher’s in France (Belgium and Switzerland as well). You can order a copy on the publisher’s website. Please note that for now, it is only available in French. Do not hesitate to ask for it in your regular shop if you cannot find it! Of course, you can easily find it online. It costs 19,95€ and has 96 pages (+ real size pattern sheets). The publisher has exclusive rights for these patterns, we will not be able to sell them separately from the book on our eshop. Try to win you copy! Two prizes are offered, each with one copy of Robes + a 25€ voucher at Stragier’s. 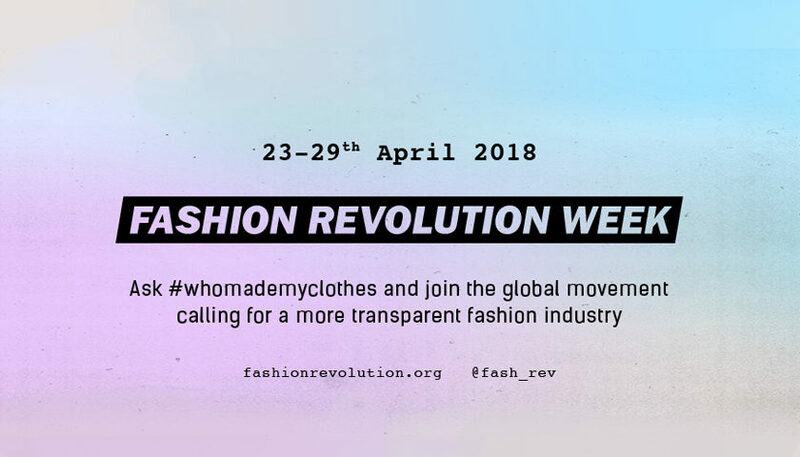 Check our Facebook and Instagram accounts (from May, 18 at 1:00PM) to know how to enter the contest! Deadline: you can play from May, 18 (1:00PM) to 22 included. A random draw will be made on the 23rd and the two winners will be warned with a private message (then announced on our social networks). We really hope you will enjoy our designs (as well as the other designers dresses, that are gorgeous!). 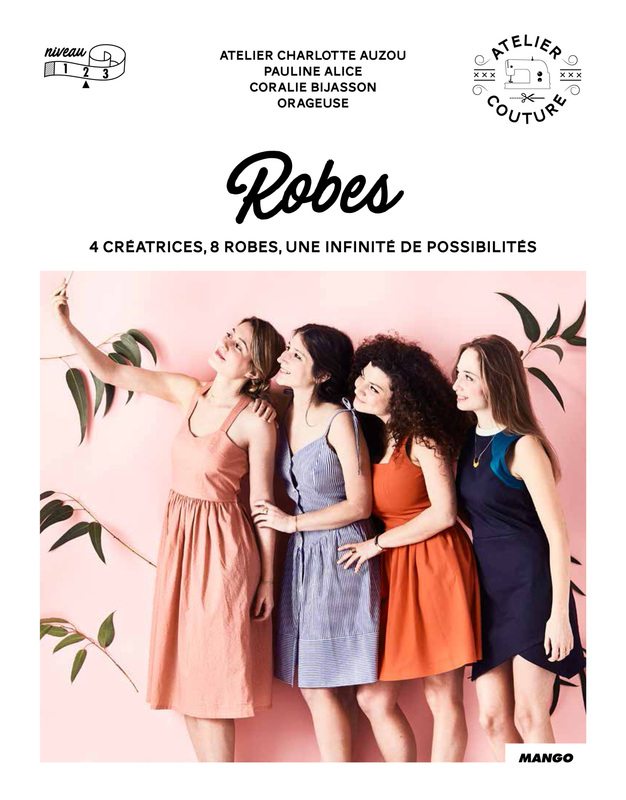 Do not hesitate to share your own dress from this book with our offical hashtags #orageuseMyrte and #orageuseGarance – we are looking forward to seeing your versions!